Momoland is fantasy realm where technology of the future and imagination run wild. It utilizes the HTC Vive system and was built in Unity. It’s a place meant for us. Uninhabited by old world expectations and ideologies. It’s a place where one can just be. It brings on the perspective of what if. What if there was a forest filled with giant crystal infused trees. Elevators made of glass that take you from the ground to prism houses. What if a city was purple and everything reflected off the walls like magic? and what if people who look like you made it? The takeaway is that you have the ability to create anything. Technology can help open those doors. But also, so can art. When people, ideas and talents merge together your dream becomes bigger and better. There is no one way to create. Just have fun, make friends along the way, and never stop doing. 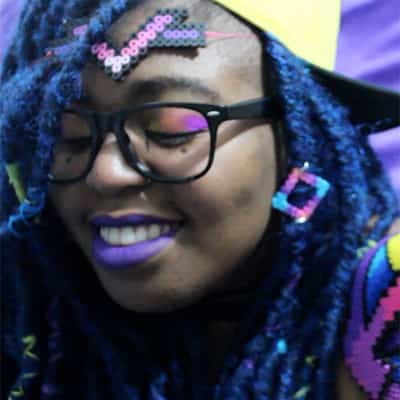 Momo Pixel is a multidisciplinary artist and musician best known for her video game Hair Nah. She created Momoland, an annual interactive pixel-art exhibition that merges art, music and technology.